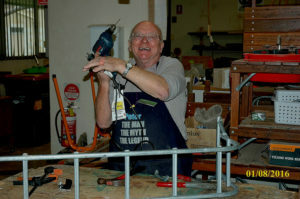 Projects Archives - Parramatta District Men's Shed Inc. 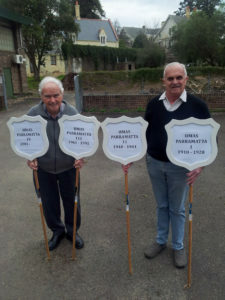 Projects Archives - Parramatta District Men's Shed Inc.
Parramatta Lion’s club commissioned Parramatta District Men’s shed (PDMSInc) to build an honour Board that would look very similar to their existing Honour Board. The existing Board was almost full. After some review of the requirements our shed identified on of members who had considerable skills at this type of project …. although it was may years since he had completed such work. With heart in mouth a quote was prepared and subsequently accepted by the Lion’s club ….. so the work started with many restless nights spent by our expert ….. worrying if he could really do this. 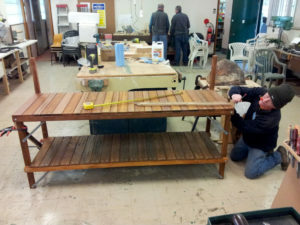 Our executive had great faith in our shed members ability and encouraged him to relax and build it …. Accuracy was so important in this project with some very fine joint work involved. 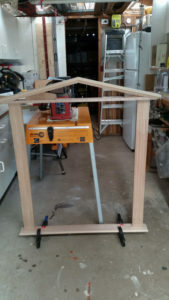 Our shed expert spent many hours practicing his joinery before the final cut …… He also built some “jigs” to help with the detailed routing required to create fluting in the pillars of the frame. 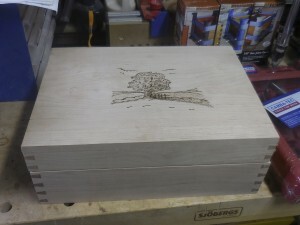 Once the frame was completed to satisfaction the infill panels had to be meticulously fitted ….. this required a great deal of patience and precision cutting …. this is where the shed “Festool” equipment came to the forefront. 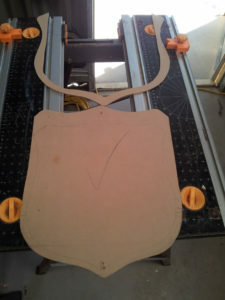 Vertical alignment of the infill panel patterns was also critical. 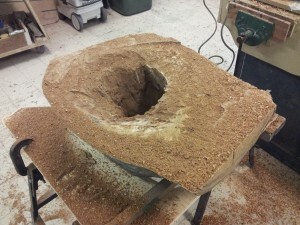 Next was the final sanding and preparation for finishing …. this took many hours of careful hand sanding and finishing in as dust free an environment possible. 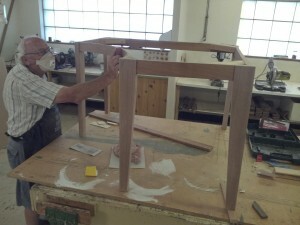 Several coats of the finishing had to be applied to obtain the professional finish required. 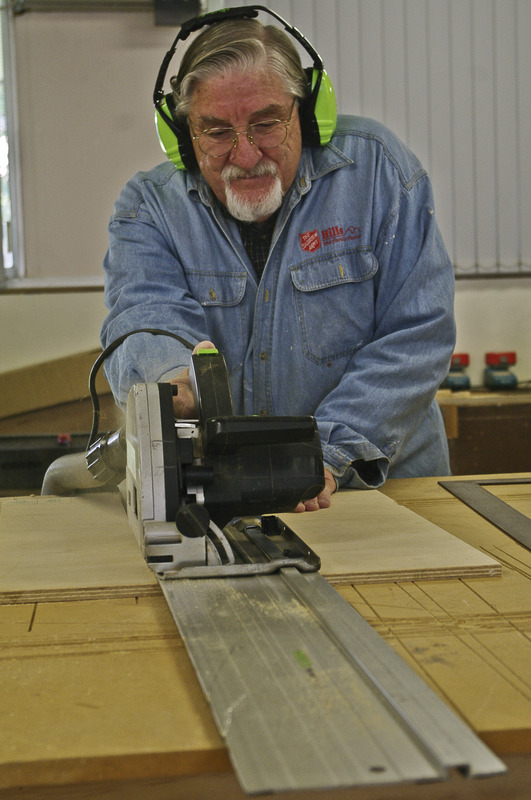 OUR SHED HAS SOME VERY TALENTED MEMBERS, and they love passing on their knowledge and helping other members improve their skills. It all starts here …. 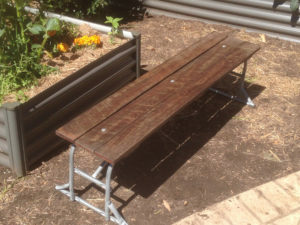 PCC asked our shed if we would like to be involved in an environmental project to help Parramatta and prevent some landfill …. 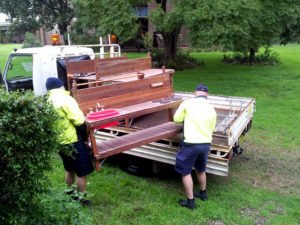 the initial plan was for Our shed, on council roadside collection days, to pick up usable re-recyclable wood and metal. After several sessions of roadside collection it became evident that there was not a lot of material to collect …. some of the locals were beating us to it ….. so we made arrangements with some of the local fencing contractors to deliver to our shed old hardwood palings destined for the tip. So a benefit to the fencing contractor and to our project. 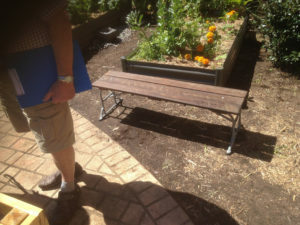 During the PDMSInc collection periods PCC discovered that Primary schools within the LGA were looking for garden type seating and potting benches for their garden areas. 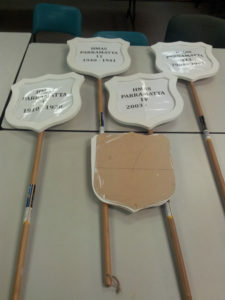 Twelve months down the track from the start of the idea the products were delivered to 13 schools in the local area …. Each standard to depict the life of each of the ships, was requested by Dave Shakespeare. 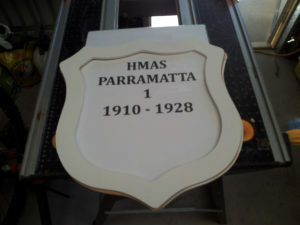 The idea was that 4 local Schools would join a parade for the remembrance ceremony of the sinking of HMAS Parramatta 11. 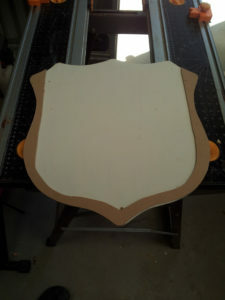 So our shed hit the action button, with one of our members (Torrie) coming up with a design and making a template. One of our other members (Rob) then proceeded to copy the template by cutting out two faces and an insert between the faces. 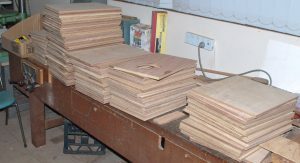 This allowed for a laminated sheet to be slipped inside the standard, thus allowing the standard to used for any occasion by changing the insert. 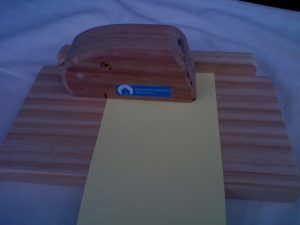 Complete with Bamboo handles and a template to help position and cut the inserts for future re-use of the standard. 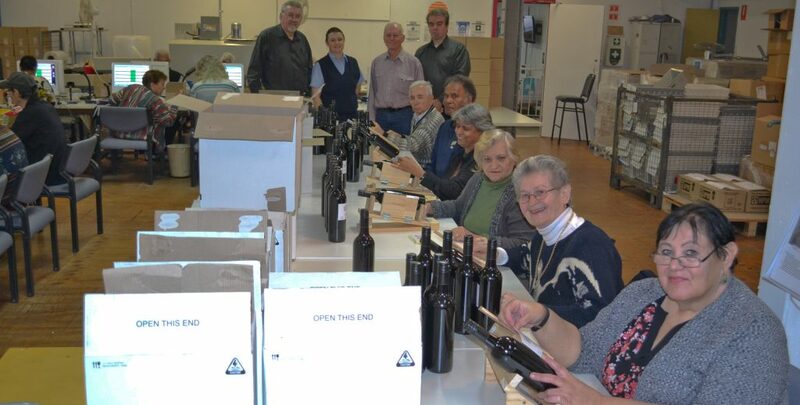 Hand over to Dave Shakespeare and one of our members (John Cole who also served duty on one of the HMAS Parramatta’s) what a coincidence and what fun to see the smiles of appreciation …..
“We are set up to help our members and the community – this looked like a great opportunity of collaboration with a like-minded organisation”. 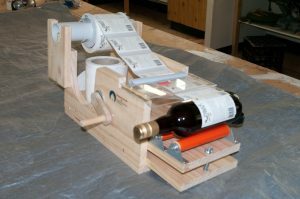 After a few weeks of design and testing, two PDMS members, Michael Instance and Rob McKenzie developed wine labeling jigs for labels on rolls and individual labels. 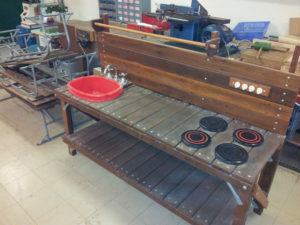 Michael Instance designed, built and road tested the muli-label “bottle labeling JIG” as seen in photograph at left. This took a couple of iterations before coming up with what our shed thinks is the PERFECT solution. 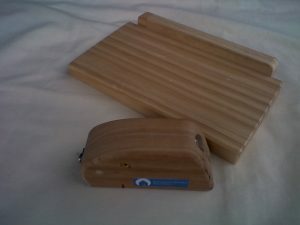 Michael’s JIG was also trialed on an experimental basis at BEEHIVE Industries co-operative, it proved so successful that orders were placed for some more. 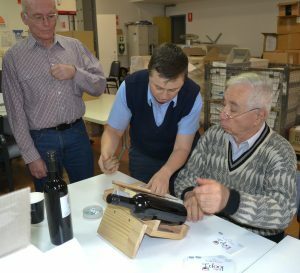 Robert McKenzie also a volunteer at our shed at this time was developing a device for cutting the backing paper on single labels as this was the in inhibitor to developing a labeling jig. 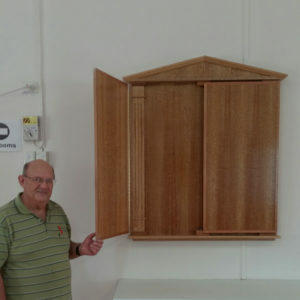 Robert persevered and finally came up with an adjustable device which is shear simplicity but brilliant in operation …..
Michael and Robert have made a couple of visits to the Beehive Industries co-operative to improve their designs and to train members and using the “JIGS. In addition when Minister Ajaka visited our shed he saw these jigs as proto-types ….. and to the Minister’s joy, he also visited the Beehive Industries (CLICK on link) only to see the “Jigs in action and saving so much time, and creating massive improvements to production. What a great outcome for everyone !!!!! 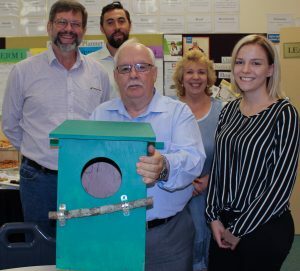 TWENTY new homes for western Sydney’s injured or displaced brush-tail possums have been built by boys from Parramatta High School with the help from the Parramatta District Men’s Shed. 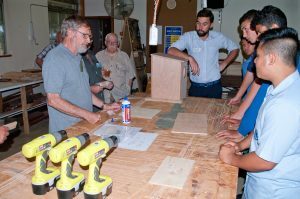 Boys (from Parramatta High School) were referred by Karabi youth center, teamed up with Parramatta District Men’s shed volunteers over a period of 10 one day sessions to construct the boxes. 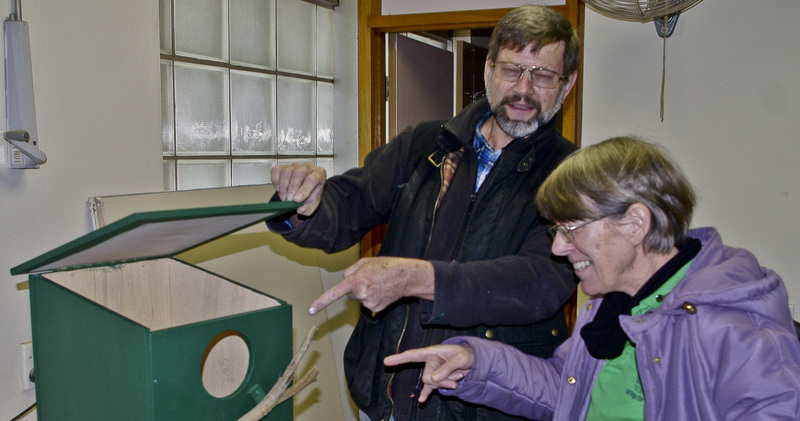 The boxes will be used by Wildlife Information Rescue and Education Services (WIRES) to re-home brush-tail possums from places like residential home roof cavities. 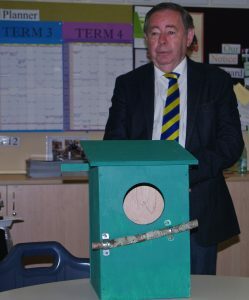 Following the successful construction of the Possum Boxes, a hand-over to WIRES was convened at the Parramatta High School. 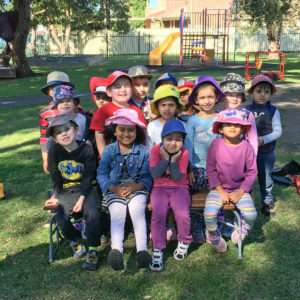 The Lord Mayor officiated in presenting the boxes and outlined how a grant from Parramatta city council to Wires was the catalyst for this marvelous community collaboration project. A thank you speech was also delivered by one of the boys. 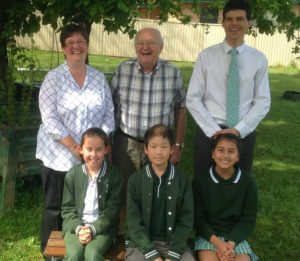 The speech was a credit to his education at Parramatta High School. Certificates were then presented to each of the participating boys by Deborah Martin on behalf WIRES. 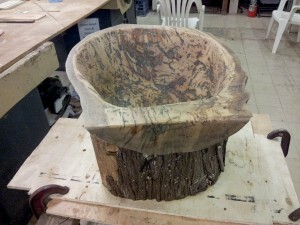 PDMSInc was asked to take the BURL that was on the side of this tree log and make a ceremonial Bowl from it. 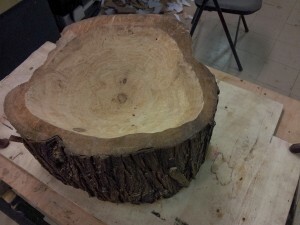 One of the shed members cut the burl with a chain saw. This is the finished Custom Computer Table that our shed was commissioned to create. 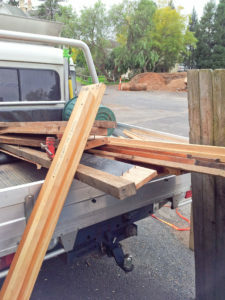 A lady approached our team at one of the Parramatta Farmer’s Markets and requested if our shed could convert a series of left over Jarrah parquetry pieces from her floor into a table …. and that is how it started. Our team came up with a design which included a curved front and provide the client with a quote, which was subsequently accepted and work began. 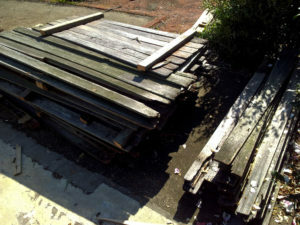 Our client was thankfully not in a major rush and said we could take up to 4 months ….. we thought this was reasonable ….. The process involved our team learning a whole range of new skills and the input from one of our EXPERT members to construction methods and refining of the design proved in-valuable. The slowest part of the whole job was actually working out how to and then building the table top from the supplied parquetry pieces. 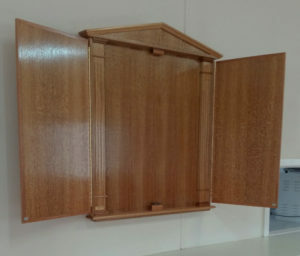 Each piece had to be squared all round, biscuit joints put in and then assembled and glued and clamped down firmly so as to provide a structurally solid and flat finish. This took over a month to do on it’s own. 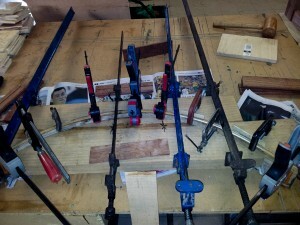 Our member had to develop jigs to keep everything true, consistant and accurate. It was very much a slow process done a row at a time. 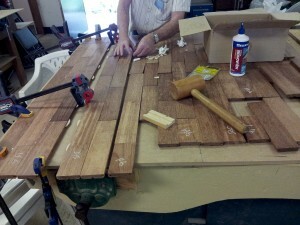 Everything was numbered as it was squared to ensure best fit and look. We then used a Festool sander and outrigger to sand the top many many times starting with a 40 grit and eventually finishing with an 800 grit sand paper. 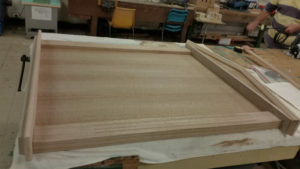 This was a critical part of the process to ensure that the table top was perfectly flat, even and most importantly appealing. 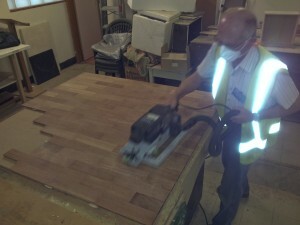 Dust was a problem so safety gear was always worn and we had overhead dust extraction sytems going the whole time. Several coats of special finish were applied to complete the effect of beautiful natural timber grains. 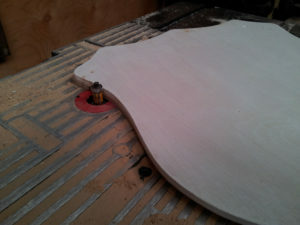 While the table top was industriously being completed another team member embarked on building from the gound up, the base for the table top. 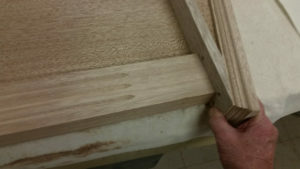 This was also a major piece of carpentry work and many new jointing techniques were learnt along the way ….. more importantly the correct way to ensure that everything was square and in alignment. 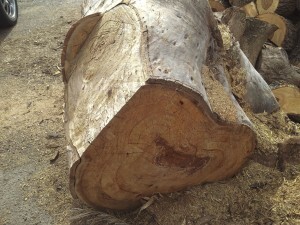 Mortice and Tennon joints were employed in the legs. 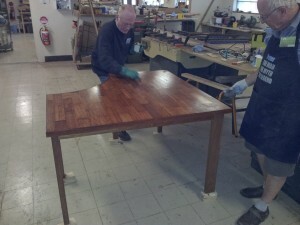 The timber was then sanded to the same quality as the table top and then stained and varnished to provide a similar appearance to the table top. 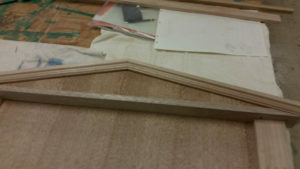 One of the more interesting techniques that our shed members learnt was to bend timber into an accurate pre-defined arc. 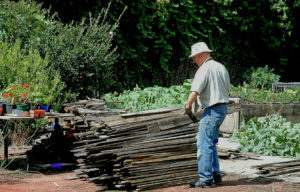 It required constructing a jig of the curavture required, cutting the timber into thin strips and then glueing them together strip by strip to form the required thickness and then applying the calmps to the jig to bend the timber into shape. 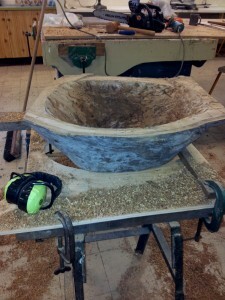 It was then left for a week for the glue to dry and the timber to mould correctly. Then carefully and accurately fitted to the table base ….. and SURPISE … the table top fitted perfectly and was level and aligned …. the team was so thrilled at the result. 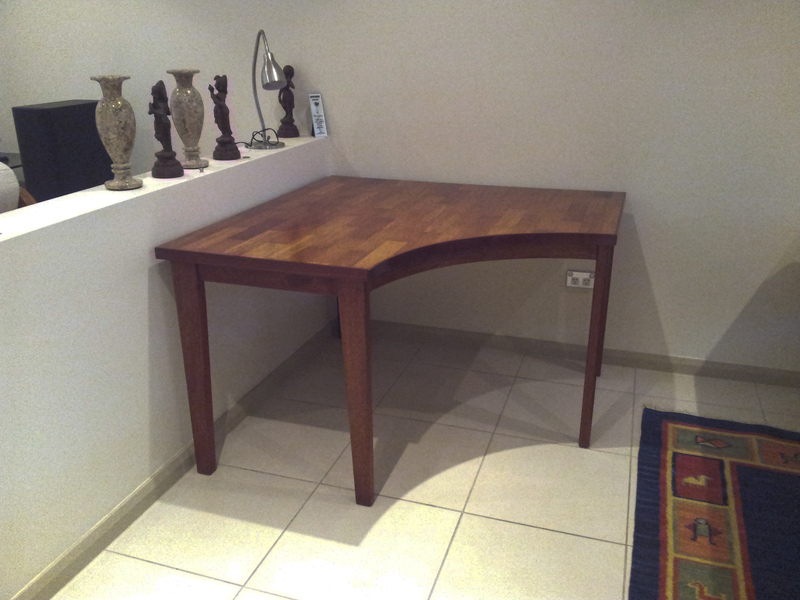 Our client was ECSTATIC when we delivered it to her home and placed it in it’s resting place …. Our client wishes to remain anonymous but we are sure you can tell who it is by the BIG smile of satisfaction on their face …. look out for them next time you are at Parramatta Centennary Square!!!!!!! 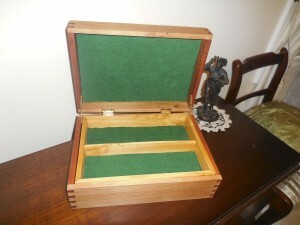 From our Parramatta Farmer’s Market stall, our shed received a request to build a Custom Jewellery Box for Susannah. 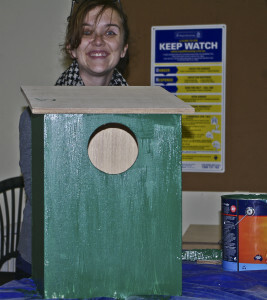 One of our resident experienced box makers and a couple of our keen shed members formed a team and created a master piece for Susannah. 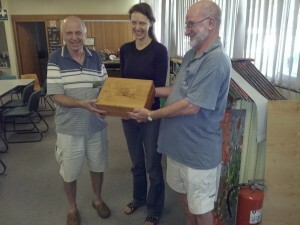 There was a combination of several different timbers, but the really unique item was a Pyrographic imprint of an Australian Gum tree on the lid of the box. A working sketch was provided by Susannah and our our resident artist …. Frank …. went to town and came up with a fabulous final product. 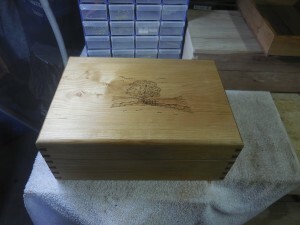 Our shed, as a result of this work has is running a box making course for our members who want to learn the art. What a fabulous outcome ……. 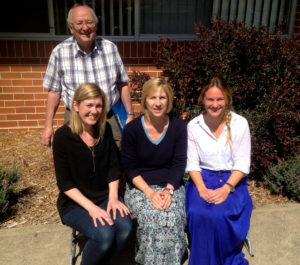 THANK YOU PARRAMATTA MARKETS for leading our shed to this opportunity …. And THANK YOU SUSANNAH for being patient and then very excited with the final product. 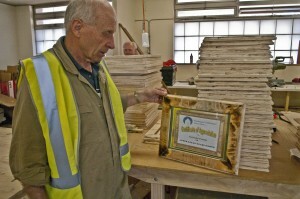 PDMS were requested to make LGSA Environment Awards 2014 picture frames. 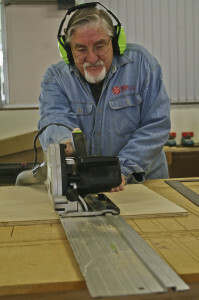 Men at the shed combined their skills to recycle some off-cuts of marine plywood, glued them together to make the thickness required, edged the frames on a router and sanded the rough timber to eliminate splinters but not the rustic look. 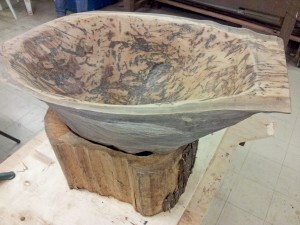 The frames were then put under a “blow torch” to create a weathered look. 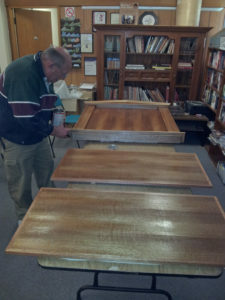 Then some lacquer to seal them. Backing boards were chamfered and the certificates mounted ready for final presentation to the lucky winners. 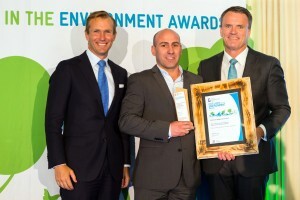 Certificates were presented to winners at a ceremony of the 2nd December 2014 in Sydney. 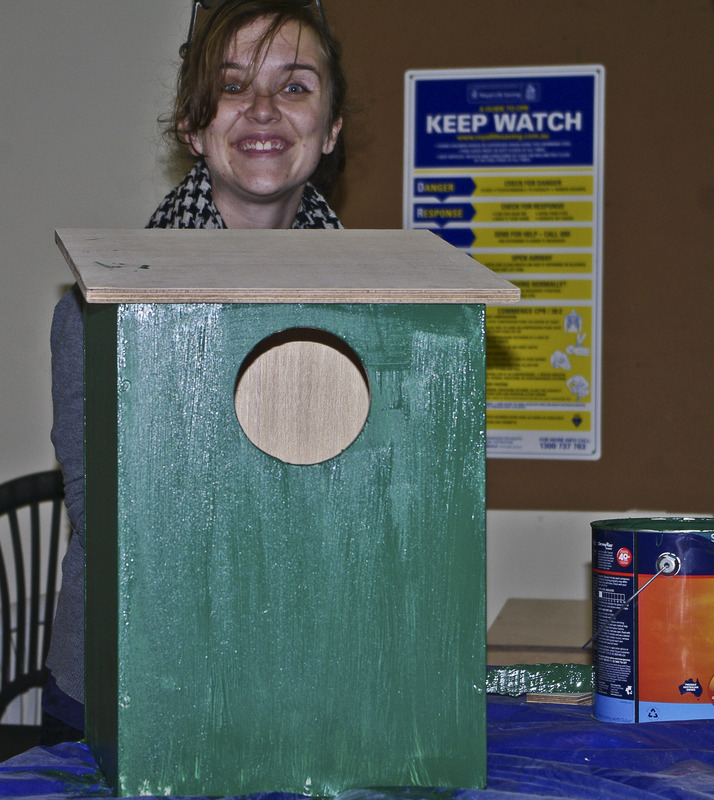 TWENTY new homes for western Sydney’s injured or displaced brushtail possums have been built by four boys from Constitution Hill with the help from the Parramatta District Men’s Shed. 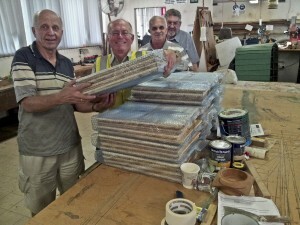 Boys from Karabi youth centre at Constitution Hill teamed up with Men’s shed volunteers during the school holidays to construct the boxes, which will be used by Wildlife Information Rescue and Education Services (WIRES) to rehome brushtail possums from places like residential home roof cavities.